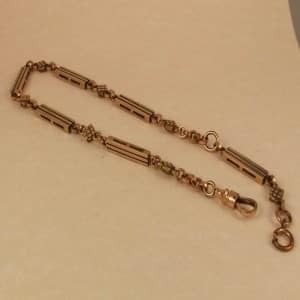 A lovely neck chain of popular length ideal to wear as a unique item of jewellery as well as being substantial so as to carry a locket, pendant or other jewellery collectables if needs be! 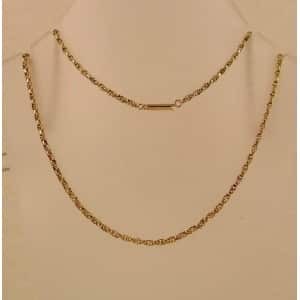 This fancy chain is an oval belcher link with faceted surfaces, at the connection point of each link is a gold wire embelishment giving a ‘byzantean style’ link. 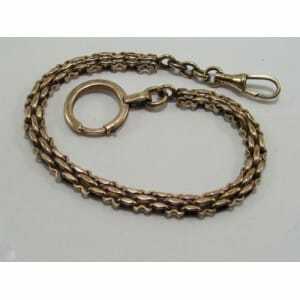 this link was very popular in victorian/edwardian times (and still very sought after today). the chain has an attractive ‘twinkly’ effect. there’s a 9ct gold tag on the link next to fastener end. the fastener is spring loaded tube/barrel fastener. 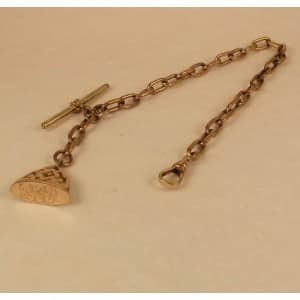 This chain is a mellow rose gold typical of 9ct edwardian gold jewellery. 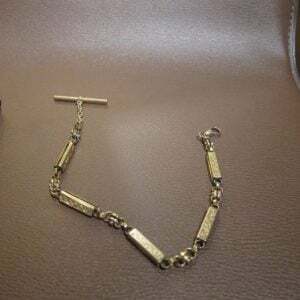 it was a quality item in its day, weighing 6.8 grams of solid 9ct gold. Condition is excellent with no split or damaged links, indeed no wear to the links at all, this chain having seen little if any previous service. The fastener closes nice and securely with a secure ‘click’.